We deliver best-in-class advertising campaigns and help you convert traffic with our MarTech solutions, offering you one of the highest ROAS in the industry! Using 1st, 2nd and 3rd party data, target your audience at the user-level at scale! When it comes to digital marketing and advertising, data drives the most successful campaigns. Using our Demand Side Platform (DSP) and Data Management Platform (DMP) we harness the power of customer data to deliver successful ad campaigns that meet your objectives and KPIs. With our DSP we purchase ad inventories in real-time and via ad Exchanges, and using our DMP we analyze and manipulate data to create highly relevant audiences and behavioral segments to target the right customers in real time. Let us grow your brand and increase your online sales by further building your online presence on social medias and better connecting your brand with your audience. Video creates high customer engagement, encourages Social shares and is a great format for mobile advertising! Telecharge, the official box office for Broadway and off-Broadway theatre tickets, has large amounts of customer data, with 230,000 unique visitors each week. But these visitors were not converting. To raise ticket sales and increase audiences, Telecharge partnered with Cybba. 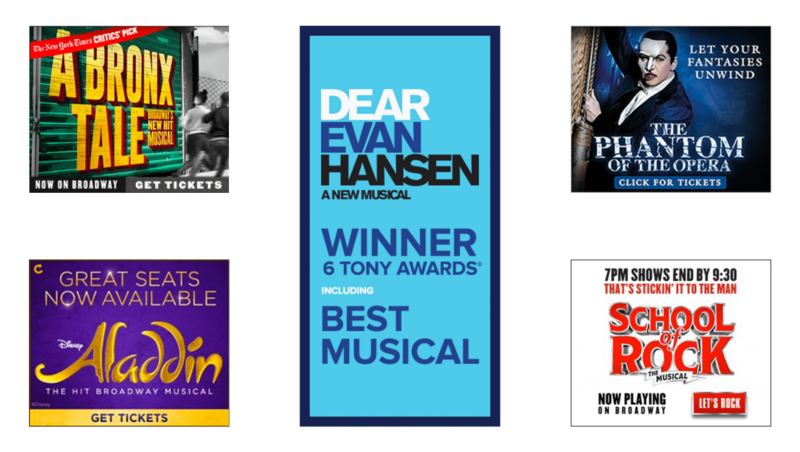 With access to Telecharge’s rich 1st party data, Cybba could create a targeting and retargeting strategy for over 50 Broadway shows. This strategy would both engage new audiences and capture ticket revenue from cart abandonment. To date, this partnership has generated nearly 24,000 conversions across 58 shows, translating to an estimated $6 million dollars in ticket sales.